Jun 6 2016 - Writing in the British newspaper “Guardian”, columnist Owen Jones gave a succinct reason why politicians in this country are trusted even less than estate agents, a breed that hardly evokes public confidence and respect. Minister of Home Affairs Vajira Abeywardena claimed that it was the Public Service Commission that made Anusha Palpita’s appointment with the involvement of the Ministry of Public Administration and Management. Sri Lanka might not have such a large brood of estate agents or house and property agents as we know them, and so their dubious tactics would not resonate as widely and deeply as with their British counterparts. But this paucity has not changed the public perception of and trust in Sri Lankan politicians which is even lower than in Britain where, as the Guardian writer points out, it is at the bottom of the public popularity ladder. I ended my column last Sunday asking readers to await the next thrilling episode of the appointment that never was, meaning the elevation in the official status of Anusha Palpita indicted several months ago for the misappropriation of some Rs. 600 million for the noble task of freely distributing sil redhi to Buddhists observing sil ahead of the presidential election. I readily admit I was wrong. What happened in these intervening days was not thrilling. It was genuinely farcical. Never in recent times has one minister provided so many explanations in such a few days on a single incident. I refer of course to the Hon. 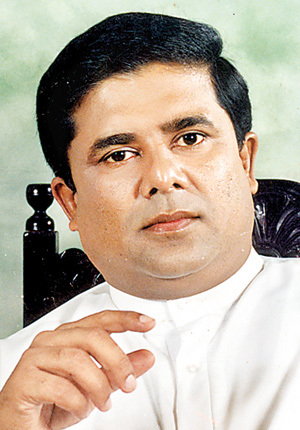 Minister of Home Affairs Vajira Abeywardena. Had Mr. Abeywardena been in the British cabinet he would have earned the prefix “Right Honourable”. Unfortunately (or very fortunately) in Sri Lanka such appellations are not available otherwise they would have been grabbed with alacrity. Those who have followed the palpitating drama of the sudden resurrection of Anusha Palpita from his paid holiday in the ‘pool’ (or is it pool side?) to a high seat in the Home Affairs Ministry, might recall the minister’s early remarks about the appointment. When the story of the appointment was first reported and protests from civil society organizations that had worked to bring the yahapalanayas into power followed, Home Affairs Minister Abeywardena put up a stout defence of Palpita like Rangana Herath did in the last test match though obviously not with the same success. Abeywardena’s batting in support of Palpita was “Bombay looking, Calcutta hitting” as they used to say in days gone-by, that it not only confused the ‘fielding side’ but the spectators as well. Such was Minister Abeywardena’s reactions to queries by the media and his own interventions at press briefings that the public naturally began to wonder which of the stories told was correct, whether they had characteristics of the tales of the fictional Baron Munchausen or whether they were that of a confused person trying to sell an explanation. On May 23 he was quoted as saying that he studied Anusha Palpita’s “case” and there are no charges against him. He is not interdicted, the minister said. “This case will be dismissed,” he said with magisterial portentousness and prophetic prescience. The very next day a news site quoted him saying that indeed there were charges against Palpita but they have not been proven. Then he added “At this rate all ministry secretaries must be guilty then”. That last remark seemed a strange piece of logic unless Minister Abeywardena was saying that all secretaries were facing indictments for misappropriation of state funds. Now the minister who boasted that he had studied Palpita’s case and said definitely that there were no charges against this man who has been indicated in the High Court for misappropriation of a massive sum of state money, was suddenly found changing not only his tune but the entire score. A short while later he said there was no such appointment and it was all a media fabrication. If that was the end of this fast changing narrative one might even forgive him despite his blaming the media. Oh no. Minister Abeywardena then claimed that it was the Public Service Commission that made the appointment with the involvement of the Ministry of Public Administration and Management, thereby hitting the ball far afield. So then PSC steps forward and its secretary Gamini Seneviratne quotes a section from the Establishment Code which says that a public official who is facing charges of corruption etc in an on-going case cannot hold a position in the public service. If he intended to educate the public he was far too late for this relevant section had been quoted by civil society groups and the media days before the PSC woke up to the fact. Surely the PSC could not have been unaware of the fact that on September 15 last year Anusha Palpita and Lalith Weeratunga were indicated in the High Court. The story was all over the print and electronic media because it was a high profile case. This pot of vicious broth was stirred some more by the PSC which claimed on Tuesday May 31 that the Ministry of Public Administration had informed the PSC “last Friday regarding the matter” and the Commission met on Tuesday to reach a decision. It could not have been such a hard decision to reach. But what is of major concern here is why the Public Administration Ministry took over eight months to waken from its supine slumber and inform the PSC of the case when the whole of Colombo had been talking about it for weeks on end. Was it deliberate or a complete oversight? Moreover does the PSC have to wait until it is informed or does it not have the power to be proactive and nudge an arm of the administration into taking relevant action? In these circumstances Palpita could have enjoyed his enforced holiday for months and even years while state institutions sat on their posteriors doing nothing. While the PSC’s brain’s trust was preparing to meet in conclave on Monday May 30 our sister paper quoted the Minister as saying that Palpita was appointed by the PSC and transferred to his ministry by the Public Administration Ministry during the floods. So it would seem that Anusha Palpita was washed with the flood waters along with flotsam and jetsam and deposited on the concrete floor of the Home Affairs Ministry as its additional secretary. What was it that Shakespeare said in Julius Caesar? “There is a tide in the affairs of men. Which, taken at the flood, leads on to fortune.” Unlike the thousands of victims of the recent flood, Palpita will probably say a silent thanks for the floods that deposited him in the Home Ministry even if it was for a mere week. That is not the end of this bizarre story. As though it was a carefully choreographed happening a team of 36 officers recently-inducted to the Indian Administrative Service were in Sri Lanka around this time to acquire a first-hand knowledge of administrative practices in the neighbouring country. No doubt they did and if they are still laughing after returning home, would it surprise anybody. If Sri Lankan politicians play pandu so do some sports bodies whose reputations have fast sunk to the status of the politicos. That in a way is not strange as politicians have infiltrated sports organizations because there is power, influence and money in them. Not all politicians at the helm of sports bodies were unworthy of their place. A former Finance Minister and leader of the LSSP Dr. N.M.Perera was chairman of the Board of Control for Cricket and served with great distinction. So did Gamini Dissanayake who worked assiduously to get test status for Sri Lanka cricket. But there are many who are there for the glory and how much they could rake off from sports funds not for the improvement of Sri Lanka cricket but for self gratification. A Sunday newspaper said last week that 13 officials are heading for London, apparently to witness Sri Lanka at cricket. No wonder there is so much public outrage at the cavalier manner in which persons holding temporary office shower themselves with the largesse that belongs to those who are genuinely committed to improving standards of cricket and in the proper administration of the game. While the public would consider 13 officials going to London highly excessive what is even worse is that some of them are accompanied by their wives and even daughters. Why should Sri Lanka Cricket pay for wives and daughters? How do responsible officials justify this? The news story did not say whether this rag-tag group includes their ayahs and house boys also probably travelling business class, but here again it would not surprise the public to know that Sri Lanka Cricket now carries excess and excessive baggage. The story which as far as I am aware has not been denied, corrected or explained by cricket authorities gives a breakdown of monies allocated to each. Those who have said they will find their own accommodation (generally meaning staying with relatives or friends if not lodging in some dump) are being provided with huge daily allowances. For instance it is said that Mohan de Silva, secretary, will receive $400 a day for 10 days. If all this is true then Sir John Kotelawala’s advice to ministers and others is being practised today with much enthusiasm and profit. Said the inimitable Sir John “Hande athey thiyanakan beda ganilla”(As long as the spoon is in your hand serve yourself). If the previous lot could do it why not us, seems to be the rationale.